Assume no-load voltages EA and EB are identical and in phase. Under these conditions if the primary and secondary are connected in parallel, there will be no circulating current between them on no load. Figure 1.48 shows two impedances in parallel. 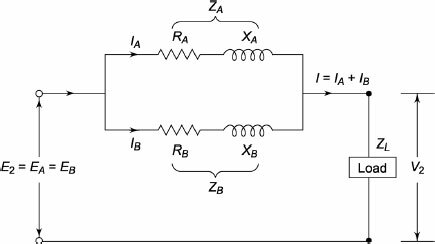 Let RA, XA and ZA be the total equivalent resistance, reactance and impedance of transformer A and RB, XB and ZB be the total equivalent resistance, reactance and impedance of transformer B. Equation (1.73) suggests that if two transformers with different kVA ratings are connected in parallel, the total load will be divided in proportion to their kVA ratings if their equivalent impedances are inversely proportional to their respective ratings. 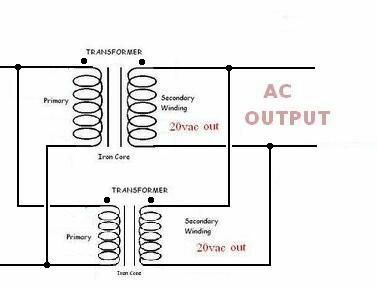 For unequal voltage turns ratio, if the primary is connected to the supply, a circulating current will flow in the primary even at no load. The circulating current will be superimposed on the currents drawn by the load when the transformers share a load. Let V1 be the primary supply voltage, a1 be the turns ratio of transformer A, a2 be the turns ratio of transformer B, ZA be the equivalent impedance of transformer A (= RA + jXA) referred to as secondary, ZB be the equivalent impedance of transformer B (= RB + jXB) referred to as secondary, IA be the output current of transformer A and IB be the output current of transformer B.